Rosa Louise McCauley Parks (February 4, 1913 – October 24, 2005) was an African-American civil rights activist. She was called the "Mother of the Modern-Day American civil rights movement" and "the mother of the freedom movement". Parks is best known for what she did in her home town of Montgomery, Alabama on December 1, 1955. While she sat in a seat in the middle of the bus, the bus driver told her to move to the back of the bus so a white passenger could take the seat in the front of the bus. During this time, when there were no white seats for white people, black people were told to get up out of their seat. Parks refused to move. She was a member of the local chapter of National Association for the Advancement of Colored People (NAACP). Like so many others she was tired of being treated as a lower class person because of the color of her skin. Rosa Parks was born in Tuskegee, Alabama, on February 4, 1913. Her parents were James and Leona McCauley. She was mainly of African ancestry. One of her great-grandfathers was Scots-Irish and went to Charleston, South Carolina as an indentured servant. Her father left home to find work when Rosa was 2 years old. Her mother taught school in another town. Rosa and her brother Sylvester were brought up by their grandparents. I'd see the bus pass every day... But to me, that was a way of life; we had no choice but to accept what was the custom. The bus was among the first ways I realized there was a black world and a white world. In 1924 she went to the Montgomery Industrial School for Girls in Montgomery, Alabama. After 5 years, she left school and went to work in a shirt factory. She also took care of her grandmother. The driver stopped the bus and called police. Two police officers arrested Parks and took her to jail for violating Alabama's bus laws. Her mother called upon Edgar Nixon to bail her out. Nixon was the president of the local NAACP chapter. Nixon knew the danger Parks was in and immediately arranged her bail. The local NAACP had been looking for a test case to challenge the bus segregation laws. Parks was a respected working woman. She was well-spoken, and her case would be a good way to challenge the law. It was decided that on December 5, a boycott of all the buses in Montgomery would be held. The word was spread throughout the black community of the intended bus boycott. Black ministers told their congregations to support the boycott. On Monday, December 5th, Rosa Parks had to appear in court. This was also the first day black riders would stay off the Montgomery buses. The streets of Montgomery were filled with black people walking to work. Black children walked to school. That same morning, all Montgomery buses were assigned two motorcycle policemen to guard against any black gangs intimidating riders. There were no black gangs. The black community simply cooperated with the boycott. The buses remained empty all day. White riders fearing trouble stayed off the buses as well. In addition to the charge of violating the bus laws, Parks was also charged with disorderly conduct. Her trial was quick, only about 30 minutes. The court found her guilty of all charges and fined her $14. The boycott continued. Parks appealed her conviction. Her attorney, Fred Parks, and others in the NAACP brought an appeal named Browder v. Gayle. [b] The appeals court ruled on June 19, 1956 in favor of the black citizens of Montgomery. But the city appealed the decision. On September 13, 1956, the Supreme Court of the United States upheld the lower court. The bus boycott ended. It had lasted 381 days. Black citizens of Montgomery could ride the buses and sit where they chose. Rosa Parks rode the bus again on December 21, 1956. This time it was an integrated bus. Ironically, she had the same bus driver who had her arrested the year before. In an interview, Parks said "He didn't react (pause) and neither did I". Rosa Parks was a heroine of the black community. While she didn't do it alone, her actions sparked a fire that led to great changes. After the Montgomery Bus Boycott, Parks went through many difficulties. She lost her job at the department store. Her husband was forced to quit his job. In 1957, Parks and her husband left Montgomery for Hampton, Virginia to find work. In Hampton, Parks found a job as a hostess in an inn at Hampton Institute, a historically black college. Later, Parks and her husband moved to Detroit, Michigan. Parks continued to work as an activist. For years, she worked for United States Congressman John Conyers. After that, she worked as an activist against apartheid in South Africa. She also opened a center in Detroit that gave advice to black youth about careers and job opportunities. President Bill Clinton awarding Parks the Presidential Medal of Freedom. Parks died on October 24, 2005, at her home in Detroit. On October 30, her casket lay in state in the United States Capitol. This is a great honor for people in the United States. ↑ The Montgomery city code made bus drivers segregate white and black passengers. They were directed to assign seats based on a person's color. Black people in Montgomery made up 75 to 80 percent of bus riders. But they were crowded into the back seats of the buses and many had to stand while the front seats remained empty. ↑ Aurelia Browder, another black woman who had been discriminated against by the bus system, was the lead plaintiff. Three other woman joined her but not Rosa Parks. Her legal advisers felt her case could not go beyond the state courts. The case was also named for the lead defendant W.A. Gayle, who was the mayor of Montgomery. Wikimedia Commons has media related to Rosa Parks. ↑ Congressional Record, V. 152, Pt. 11, July 13, 2006 to July 24, 2006, Part 11. Washington, D.C.: Government Printing Office. United States Congress. 2006. p. 15310. ISBN 978-0-1608-6155-0. ↑ Houck, Davis; Grindy, Matthew (2008). Emmett Till and the Mississippi Press. Jackson, Miss. : University Press of Mississippi. p. x. ISBN 9781604733044. ↑ Federal Bureau of Investigation (February 9, 2006). Prosecutive Report of Investigation Concerning (Emmett Till) (Flash Video or PDF). Retrieved March 2, 2016. ↑ Ajay Moholtra (1 June 2008). "Rosa Parks & the Montgomery Bus Boycott". Rosa Parks Facts.com. Retrieved 3 July 2014. 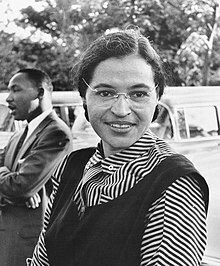 ↑ 20.0 20.1 20.2 "Civil Rights Icon Rosa Parks Dies". NPR Online. October 25, 2005. Retrieved February 17, 2016. This page was last changed on 3 April 2019, at 07:00.